Modular Digitizers, Arbitrary Waveform Generators (AWG's) and pattern generators are rapidly becoming instruments of choice for the automated testing systems used for semiconductor device characterization. Small and compact these multi-channel products are available from Spectrum in a variety of popular standards including PCI, PCIe, PXI, cPCI and LXI. They offer bandwidths from 50 kHz to 1.5 GHz, sampling rates from 100 KS/s to 5 GS/s, and resolution from 8 up to 16 bits. To enable easy integration into ATE systems Spectrum includes software and instrumentation drivers that work with 32 bit and 64 bit versions of Windows and Linux. Programming of the cards is possible using a wide range of languages such as LabVIEW, LabWindows/CVI, C++, MatLab, Borland Delphi, Visual Basic, VB.NET, C#, J# and IVI. For applications demanding large dynamic range and maximum sensitivity high-resolution 14 and 16 bit digitizers are available that allow the capture and analysis of signals that go as high as 250 MHz in frequency. These high-resolution products deliver outstanding signal-to-noise ratio's (up to 72 dB) and spurious free dynamic range (of up to 90 dB) so that small signal variations can be detected and analyzed. For measurements on even higher frequency signals digitizers with sampling rates up to 5 GS/s and bandwidth over 1.5 GHz make it possible to capture fast pulses and edges down into the nano and sub-nanosecond ranges. To match the wide range of signals found in semiconductor testing Spectrum digitizers also include flexible front-end signal conditioning circuits. Computer control makes it easy to adjust key parameters such as input gain and offset or select the desired coupling and termination. The digitizers are also equipped with ultra-fast trigger circuits, complete with trigger time stamping, so that the dead-time between acquisitions can be extremely small (down to as little as 16 ns). Together with large on-board memories (up to 4 Gsamples/card) and advanced streaming and readout modes this makes the digitizers suited to applications where long and complex signals need to be captured and analyzed. Data can be stored in the on-board memory or streamed in FIFO mode over a fast bus like PCIe to a PC. To help with data analysis and data reduction Spectrum's M4i series of digitizers also feature on-board FPGA based processing functions that can be perform on-the-fly Averaging and Peak Detection routines. Digitizer cards can have from one to sixteen channels (up to four channels for AWG's) and the cards can be linked together with Spectrum's StarHub system to create instruments with hundreds of fully synchronous channels. The cards also offer additional analog and digital I/O capabilities as well as advanced triggering and clock options so that they can work together with a host of different test instruments making them perfect for high-density multi-channel applications. For systems where remote monitoring and control is mandatory it's also possible to use Spectrum's digitizerNETBOX series of fully LXI compliant digitizers. The digitizerNETBOX products use Ethernet to connect to a PC or anywhere in a company LAN. 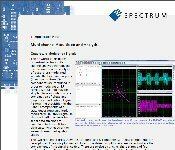 Spectrum AWG's and pattern generators can also be used to create the variety of analog and digital test signals that are typically needed to stimulate a device under test. High resolution 14 bit AWG's, clocked at 125 MS/s, allow the generation of high-purity wide dynamic range analog waveforms while digital acquisition and generation cards can be deployed whenever a high number of digital channels (up to 64 channels per card) are needed. Typical applications in semiconductor testing include mixed signal measurements, amplifier testing, micro-electro-mechanical system (MEMS) devices, radio frequency IC's (RFIC's), power management IC's and components. Modular digitizers allow accurate, high resolution data acquisition that can be quickly transferred to a host computer. Signal processing functions, applied in the digitizer or in the host computer, permit the enhancement of the acquired data or the extraction of extremely useful information from a simple measurement. Modern modular digitizers, like the Spectrum M4i series PCIe digitizers, offer greater bandwidth and higher resolution at any given bandwidth than ever before. Although they are in the class of general purpose measuring instruments they are capable of many RF and lower microwave frequency measurements. This article focuses on some examples of common RF measurements that can be performed with these modular digitizers.